Freestyle Keyboard For Those With Split Personalities | OhGizmo! By Chris Scott Barr on 06/10/08 • Leave a comment! I’ve used many keyboards over the years. Everything from your run-of-the-mill standard setup, to dedicated gaming keyboards to the fancy ergonomic ones. At the end of the day I usually turn back to something a little more on the side of ordinary, with maybe a few extra features. However, if you’re into ergonomics and the Mac is your system of choice, you might want to check out the Freestyle Solo Keyboard. This is one of the first keyboards I’ve seen that actually separates into two pieces. This is supposed to allow you to create the perfect setup for comfortability and ease of use. I learned long ago that I don’t actually type all of the keys with the correct fingers, which always presents an issue when working with ergonomic keyboards. It doesn’t slow me down much when I use one, but there is a small period of adjustment. 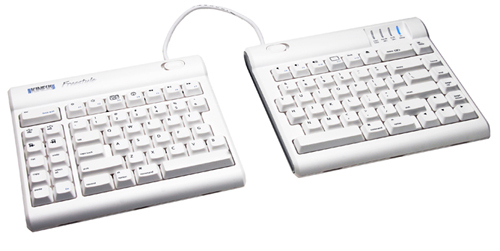 This interesting keyboard, which is designed with Mac users in mind will set you back $99. You can also get it bundled with one of two different accessories for $149.